Batteries tend to lose up to 60% of their strength during colder temperatures. Ideally, a cold engine requires more than 60 percent of the battery’s current to get started. Also, battery life tends to be shorter due to the demand of modern electronics in vehicles. Roadside assistance calls are more when the temperature drops. Most of these calls are requests for car jump starts. To avoid such calls, you can buy a portable, rechargeable battery jump starter. These devices offer about ten jump starts per charge. They are sized to fit in the trunk, hence convenience to carry. While some are multi-functional, others specifically meant to offer premium jump start capability. Some have up to 12 volts and can be used for modern trucks and passage vehicles. If your vehicle exceeds 1-ton, you should not use anything less than a 12-volt unit. Make sure you choose the best car jump starter before making a purchase. The reason is that most jump starters are powered by hazardous materials and can’t be returned. Here is a comprehensive car jump starter review to guide you before making a choice. Learn more reviews :Best Floor Mats for Trucks (Reviews), Top LED headlight conversion kit (Reviews). The Jump-N-Carry JNC660 is slightly Spartan in comparison to many others in the market. In addition to the jumper ability, it features a DC outlet. It offers 425 cranking amps and 1,700 peak amps. Thus, it’s ideal for large applications up to a one-ton pickup. This model is a heavy-duty unit and can be used up to 2000 times in a year. This jump starter weighs only 18 pounds and has a top hand handle making it portable. 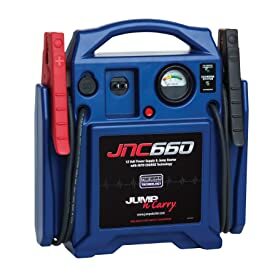 This car jump starter features JNC105 cloreproformer battery, mainly, meant for car jump starting. Extended cranking duration, incredible durability, and extreme starting power are some of the benefits of the proformer battery. You will appreciate the built-in automatic recharging of this jump start. Simply connect any extension cord. The charging status LEDs shows you when the unit is fully recharged. However, it can remain connected to AC power without any adverse effects. The heavy-duty long reach cable delivers premium starting power. The cable measures 16 inches long and effectively transfers power to the vehicle. The Nekteck is a powerful, compact car jump starter designed to charge everything. It can fit in the glove compartment of your car or pocket making it convenient to carry around. It features a Li-Polymer battery with a 12000mAh capacity to charge any device. If your car’s engine becomes very cold, you won’t have to call for assistance. Never worry about your, iPhone, tablet or Smartphone running low on battery. Those who enjoy outdoor activities do not need to carry an additional flashlight! This powerful car jumper will solve all these problems. It comes with a micro-USB cable to take care of all USB supported devices. The 600amps of power jump can start 3.0L diesel or 5L gas vehicle engine. You can use the Nekteck for jump starting your truck, SUV or Van. 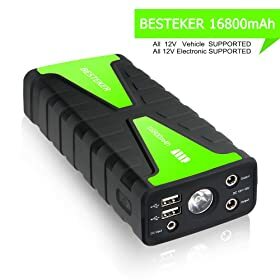 It can jump start your car up to 12 times, all that you need to get back on the road. It has a built-in LED flashlight to save you in case you get stranded at night. This unit has safety protection for overvoltage, overcurrent, overcharge and short-circuit. 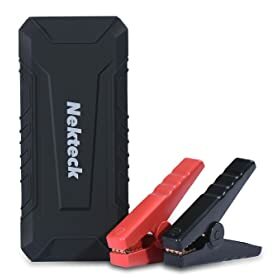 The package includes a Nekteck car jump starter, a car charger, a micro USB cable, a jumper cable with battery clamps and a portable carrying bag. If you want to avoid calling for assistance when your car fails to start, get the best jump starter. The Besteker is a powerful unit that won’t fail you. Its ultra compatible, you can use it for any 12-volt vehicle and also for most digital devices. This car jump starter is very handy. Measuring 7 inches by 3.3 inches by 1.8 inches and weighing 1.3 pounds, it’s highly portable. The portability nature also makes it reliable when you are traveling during cold weather. It works in temperatures ranging from -20 degrees centigrade to 60 degrees centigrade. It comes with a high capacity battery: 16800 grade A electric cell that offers amazing endurance. This battery jump starter has a peak of 800A; the output is 5V/12V and USB output of 5V/3A. Thus, you can use it to jump start your car several times with a single charge. The Besteker features tough shell. This wear-resistance plastic cover perfectly protects the unit. It has an all-round protection; overheat, overshoot, over-discharge, over voltage, leakage, short circuit and many other protective functions. The package includes a Besteker car jump starter, an adapter, a car charger, a charging cable, an ignition power cord and a DC transverter. Those who want to avoid frustrations of calling for assistance during cold weather should consider purchasing a car jump starter. In this review, we have covered the best car jump starters in the market. They are multi-purpose and handy. Hence, your Smartphone or tablet battery won’t run low. Also, you can use the Besteker or the Nekteck to power speakers. The flashlight function allows you to walk at night without fear. The three jump starters in this review can work in extremely cold temperatures. They offer extreme jump starting power. If you are ready, simply choose one of them since they are affordable.